The show is the most recent iteration of a body of work Cuppetelli began in 2012, concerning the aesthetics, materiality, and politics of corsetry. 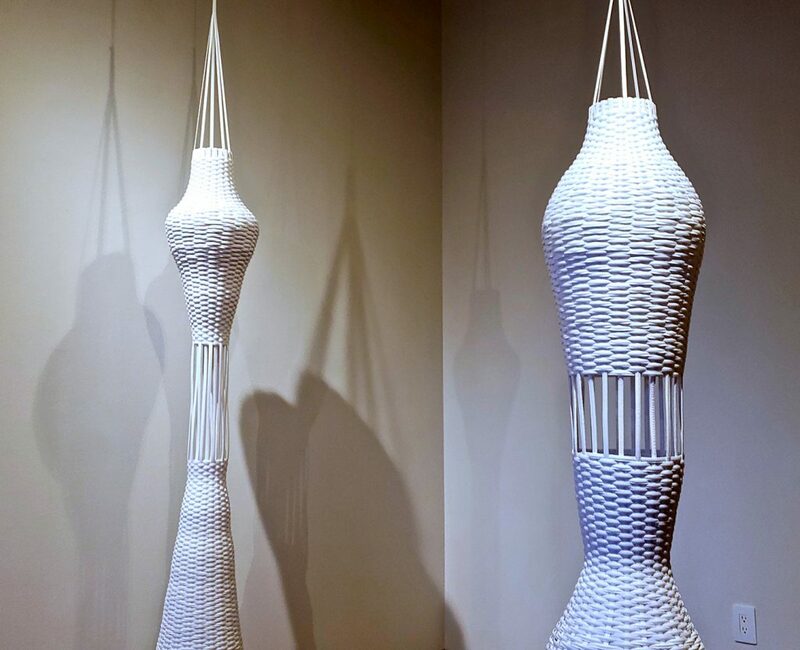 Cuppetelli’s forms are abstracted bodies and vessels, rendered in clean white corsetry boning that has been painstakingly handwoven in its negotiation of forms. And make no mistake: it is an act negotiation. Working with corsetry materials is a painful give-and-take process, as the boning that gives undergarments their structure is literally designed to force bodies into unnatural shapes. Cuppetelli’s determination to exert her will over these forms comes at no small cost; the artist had to make an emergency trip to the hospital after throwing out her back on New Year’s Day, in the push to finish work for the show’s January 11th opening — and that’s hardly the only injury she’s sustained in the course of this line of artistic inquiry. “My hands really hurt,” she confided during the gallery tour the day after the opening. Looking at the meticulous weft circumscribing her figures, it’s no wonder.